I haven't been taking much pictures this year but planning to get better with this. The weather is getting better and therefore opportunities to go outside are increasing. So last sunday I decided to go to Cape St. Mary's to see the seabirds colony.Wanted to take the Irish loop so I had to leave fairly early to be able to spend most of the day in Cape St Mary's. 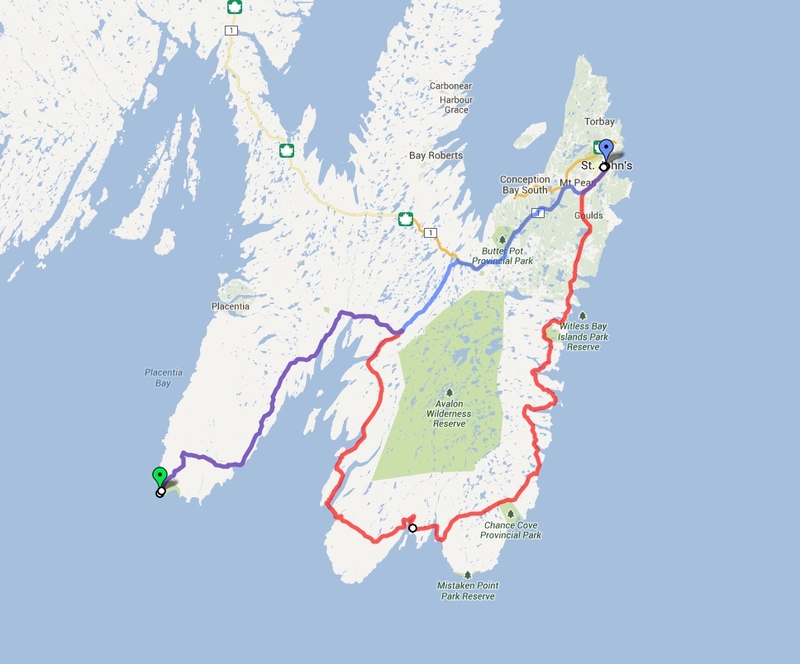 Depart from St John’s around 4:30am following the Irish loop (in red, about 350km) and returning by the highway around 7:00 pm (in blue, about 180 km). The days are quite long and as I was leaving St John's the sun was already getting up offering some nice light. Unfortunately I was a bit disapointed by the Irish loop, I was expecting much more scenic view of the ocean and the cliffs from the road, but there is only 2 or 3 spots which offer a nice view. However, it gave me the opportunity to encounter my first moose which proved to be quite an excitement! I was able to spot the first two from far ahead which is good because I wasn't thinking about them at all while I was driving, was a bit more aware afterwards. What are you doing on our road ? After that, the road became quite foggy and later on I barely spotted another moose on the side of the road. That one staid close to me for a while before slowly vanishing in the mist. Ok, enough with moose, this is not the topic of this post ! As i get close to the cape, I stop and start worrying about the weather conditions! An example of the taking off sequence. One of the adults always stay on the nest, when one of them wants to leave, it is indicated by raising their bill and neck towards the sky before taking off. Around 9:30 am the light comes through as the fog slowly disappears. Just for the view it's worth coming. After that, the fog will not appear before later in the evening. It's already lunch time, and the sun is now high in the sky, beautiful views of the cape appear. The white on the cliffs are gannets, quite a few hey! The place is really overwhelming, there is so many birds that it's hard to focus on one specific bird/couple and it takes a while to not get distracted by all the surroundings. There is a lot of interactions going on. Even tho most of the pairs don't have chicks yet, there is a bit of fighting going on. I saw a couple of mating sequences but only captured one and not from the greatest angle but at least it gives an idea. Having a bit of afternoon delight. As I said above, most of the pairs are still hatching their eggs but you can see a few chicks every now and then. The sun is still high so the light is quite harsh so not so many photos taken between 2:00 and 4:30 pm. Also this is the time of the day where there was the most visitors so not as comfortable to be switching around the different points of view. Around 6:00 pm a lot of agitation: loads of birds suddenly all come back together. I guess from feeding at sea. And during the next hour it is non stop landing and taking off. Birds passing by almost close enough to be touch. Quite an impressive feel to see such massive birds from so close. And the madness begins ! Most of the birds pass over the main rock a first time to check where is their nest before actually landing. There is also an interesting scene that can be seen, the birds make a quick stop on the cliff above the nesting rock to collect some grass and fly down to bring it to the nest. The light gets a bit softer by then but my memory cards are full so I try to take a few extra shot with whatever space I have left (note for self, get some spare memory cards!). It's about 7:30 pm and I have a serious headache, almost bald without a hat under this sun is no good so I decide to call it a day! I wish I could stay a bit longer to get sunset light but I'm not feeling too well! This is NOT a cheesy picture ! So overall an amazing day. This is gannet heaven, so many birds with such proximity is pretty cool. Also there was surprisingly not that many people around. At the most there was about 15 people but for most of the time I was alone with another fellow photographer. Hope to get back this year later on during breeding season!